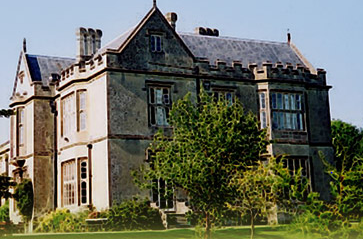 This page is a summary of our symposium held at Abbey House, Glastonbury on April 17th 2011. On it we summarise the presentations, discussions and decisions made. The Glastonbury Pilgrim Reception Centre, now known as Glastonbury Reception Centre and Sanctuary, first opened its Centre in 2007. Since then we have had an increasing number of enquiries from visiting research students and have been actively involved in helping them during their stay in the town. This prompted the idea of setting up a symposium to explore, with visiting academics and locals involved in supporting these research students, whether some more established form of research support might be set up in Glastonbury. The PRC undertook responsibility for funding and organising this symposium and for taking forward any suggestions that might arise. The symposium was partly funded by the Glastonbury Trust and we are grateful to them for their support. The PRC retained the services of Dr Liz Williams as coordinator of the symposium and we are grateful to her for the huge amount of work that put in to organising the event. The nature of pilgrimage in Glastonbury. What Glastonbury has to offer to support such study i.e. people, places, buildings, beliefs, energies etc. Exploring whether some form of active support service in Glastonbury for such research would be helpful. 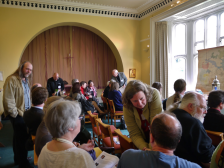 The original concept of the Symposium was that the event would provide a meeting place for academics, local researchers and those involved in the spiritual communities of Glastonbury to discuss the eventual viability of establishing a research support centre in the town. This is an idea that has been coalescing for some time, given the increasing amount of academic interest both in Glastonbury as a functioning spiritual community, and in the ‘spiritual economy’ itself. Institutions such as Bath Spa University already send students here on a regular basis, primarily at undergraduate level, but we also have visits to the town from a number of postgraduate visitors as well as independent researchers. It was thus felt that a series of presentations by academics who are interested in Glastonbury as a focus of study would be of interest to the wider community involved in the study of history and contemporary spirituality. Prof. Hutton began the proceedings with a discussion on the history of Glastonbury as a centre for pilgrimage, beginning with the Abbey as the principal destination of pilgrimage within the town throughout the Middle Ages. This obviously came to an end with the Reformation, and Professor Hutton gave a brief elaboration of local reactions to the dissolution of the Abbey. Pilgrimage revived in a different form during the early years of the 20th century, with the emergence of interest in Glastonbury as a spiritual and esoteric centre and the interest and publicity given to the town by practitioners such as Alice Buckton and Dion Fortune. Prof. Hutton spoke at length about the relative lack of archaeological finds in the vicinity, and invited speculation from participants as to why this might be, touching upon various theories relating to ways in which the Tor/island may have been seen by our ancient forbears. His presentation concerned three principal areas of interest: the Tor itself, the Chalice Well, and Maltwood’s Zodiac. We see these not as actual archaeological artefacts, but nexi of myth, around which both theory and legend have grown, thus establishing modern Glastonbury as a centre for pilgrimage around new, as well as ancient, monuments. The Imaginal Landscape – Sacred Landscape and Pilgrimage. John Wadsworth’s discussion focused on the power of intention in working with and creating the landscape. The primary focus of his talk was the Glastonbury Zodiac envisaged by Katharine Maltwood, and Mr Wadsworth was careful to note that although this may not possess an objective reality within the landscape, it nonetheless remains a powerful tool for spiritual experience and transformation. Epistemologically, this is a most valuable point, as there are a variety of ways in which we can assess spiritual experience and evaluate their ‘truth’ accordingly. Mr Wadsworth spoke about the role of intentionality in imbuing the landscape with meaning - visualising, holding the vision, enlisting support, sustaining the vision, and materialising the vision. This is a dynamic process, which Mr Wadsworth himself is working with in terms of taking groups to various sites of the Zodiac. He commented on the curiously numinous quality that the Zodiac produces – that whilst the ‘monument’ itself has very little basis in established geology or archaeology, it nonetheless produces profound spiritual effects in those who engage with the journey that it offers. This led to a discussion relating to the compelling imagery of these ‘landscape zodiacs,’ and the ways in which the landscape surrounding Glastonbury has itself become a centre for a particularly dynamic form of pilgrimage: the Tor, for instance, seems to produce a singular effect on many of those who see it and who are drawn to revisit Glastonbury again and again. Bath Spa University’s Programme of Student Placements in Glastonbury. Dr. Denise Cush introduced the Symposium to the system of academic placements which BSU now have in place for undergraduate study. She elaborated on the programme in relation to Glastonbury, where BSU have been placing students for quite some time. This has been a successful part of the programme, and her presentation centred on introducing us to a number of case studies. Students at undergraduate level undertake a visit to Glastonbury as part of their core compulsory course (study of contemporary spiritualities and the methodology of religion), plus a one-week placement of second year students. These students will visit sites such as the Chalice Well and the Goddess Temple, and their experience of these spiritualities is therefore intended to be direct but objective – although students may experience a personal spiritual transformation, this is not the aim of the exercise! Students report a substantial value in the exercise, saying that they experience authenticity and learn by seeing and doing, although there may be disadvantages in terms of too brief a time spent in the town, bias or selectivity in the subjects interviewed, and deviation from academic norms. They are also concerned about asking questions without giving offence, and experiencing challenges to their own spiritual values. They are given a placement which specifically does not reflect their own personal spiritual path. Dr Cush invited comments on the programme itself in relationship to Glastonbury and how this might be taken forward. The Unique Facilities of Glastonbury as a Pilgrimage Centre. Dr. Marion Bowman spoke on the concept of Glastonbury as a pilgrim centre, elaborating (coincidentally) on the theme of the area which is contested in spiritual and theological terms, with a number of sites being ‘multimythological.’ Thus the Chalice Well is of note to both Christians and Goddess worshippers, for instance. She also cited the landscape as a crucial character in Glastonbury’s narrative – therefore revisiting a concept commented upon by both Hutton and Wadsworth. She also commented on the nature of Glastonbury as an information centre and as a centre for the spiritual economy. Pilgrimage centres are contested places with a particular economy: Glastonbury is a centre which is particularly varied and diverse. She drew the analogy of Mind, Body and Spirit Fairs, in which there are different truth claims but the modus operandi is primarily relativistic and tolerant, with an emphasis on working together. She commented upon the Pilgrimage Reception Centre, which in many ways exemplifies this communitarian spirit – a microcosm of contemporary pluralism which may not be as easy to see as ethnic diversity, nor which is typical, but which is indicative of current trends. It functions as a one-stop shop for the contemporary spiritual seeker! In addition, Dr. Bowman spoke of the role of observing students and the possible tensions inherent in their role when studying a particular community, a tension which is lessened in the case of Glastonbury due to its tolerance. She cites Glastonbury as a pilgrimage centre par excellence. Organisation and Development of an Academic Support Research Centre in Glastonbury. This research has shown a slightly different emphasis in each of these categories in the different centres. Dr Goldingay emphasised the role that Glastonbury plays as a centre for bringing together diverse discourses – a theme which has also been explored in the preceding presentations. She commented on a new discourse deriving from Performance Studies, and taking the form of ‘mythogeography’ – the cross-discipline which emerges from areas such as archaeology, art, dance and performance – in which landscape plays a crucial role. Dr Farias also commented on the various directions in which interdisciplinary research can go and compared the study of spirituality in Glastonbury with that of other pilgrimage centres, such as Santiago de Compostela. I. The nature of contested sites. A number of our speakers explored the issue of Glastonbury’s large number of contested sites and contemporary ‘monuments.’ Sites such as the Tor ‘labyrinth,’ the Chalice Well, the Holy Thorn and others are viewed as places of intrinsic spiritual interest by a wide number of groups (Christians and pagans of various forms, Buddhists and others). As some of our speakers have commented upon, it is the ‘fluid’ quality of these multivalent sites which is proving to be of particular interest to researchers. 2. Glastonbury as a research centre. Many of those present saw Glastonbury as a unique facility where the way in which contemporary spirituality manifests in the practical world can be observed. It also could be thought of as an ideal laboratory for practical research. There was a feeling that if we could put something coherent together here there would be interesting work and revenue not only for people in Glastonbury but also for our friends in the universities. 3. Human Resources. An interesting point that arose was that, quite apart from the landscape, the town and its activities, there is, in Glastonbury, an abundance of human resources that is potentially available to help with research projects. In the town there is a wealth of people with a research/academic background in some form, and this is currently being under-utilised. Could this human resource be harnessed in some way and channelled into assistance for academic programmes? 4. Glastonbury as a broker for cross-disciplinary research. The community and its various activities and beliefs are of potential interest to a wide range of academic disciplines – theological, sociological, anthropological, political, economic and others. 5. Glastonbury as a centre for consensus and the concomitant study of consensus. We would suggest that consensus is an emergent property of community, and that this property has partly been exemplified by the Symposium itself, featuring a wide range of personal spiritualities and disciplines. Glastonbury could well have a role as a place of studying the way in which consensus emerges in a community with many different philosophies and beliefs. 6. Explaining Glastonbury. Representatives of the Library of Avalon, the Isle of Avalon Foundation, the Abbey and the PRC who were present all mentioned that they have the repetitive task of explaining to each new bunch of researchers and students the basic outline of Glastonbury. Some agreed format or paper which all could use would be a help. 7. Assistance for placement programmes. It would be useful to have some sort of an agreed programme to ensure that placed students gain the most from their placement. 8. Glastonbury as a Whole. Glastonbury was seen as a place with an ancient and special landscape that has sparked off a number of quite separate individualistic activities. These activities were not seen as being particularly related. It does seem that work is still needed on promoting the idea of Glastonbury as a whole as a spiritual centre. Glastonbury is in fact, other than in name, a University of the human spirit, with a wide range of faculties within the University. These are provided by individual courses, workshops and researchers. 9. The establishment of a Glastonbury museum. A considerable amount of interest was shown in the possibility of establishing a museum to support the work of the research centre. Such a museum could focus upon the history of spirituality within a Glastonbury focus featuring, for instance, material such as the Maltwood archives. 10. Academic research. There was a broad consensus from the visiting academics that now is a time of uncertainty in all universities. No one quite knows what funding is going to be available for what - certainly funding is being severely cut in areas such as the arts and comparative religion. On the other hand there are still funds available for some types of research. There was a general feeling that it might be possible to create something really worthwhile in the way of research in Glastonbury. 11. Timing. There was a feeling that the time might well be right for setting up a new cross disciplinary research centre. The pressure on funding has meant that individual faculties are more open-minded and interested in working with others than would have been the case a year or two ago. There was a broad consensus that some form of support for academic research in Glastonbury would be helpful. The need for consolidation of information on courses and workshops in Glastonbury. How can we most effectively work with other organisations/individuals outside Glastonbury to set up courses to in order to complete the range of services required? How can we best offer practical support to academics wishing to set up research projects in Glastonbury? How can we also best offer practical support and help where needed to individuals and projects offering courses and academic services in town. A ‘scholar in residence’ program – some sort of resident academic researching into the relationship between science, economics and spirituality. Creation of ‘subject’ panels of people interested in specific subjects. Setting up a database of human and other resources. Possibly the PRC website could host PDF articles and book chapters. Organising activities within Glastonbury – The PRC, in partnership with others, to undertake responsibility for researching facilities available within Glastonbury and coordinating local research activities. Separate premises are not needed immediately but these could be considered when the project achieves some real momentum. Funding – Dr Goldingay undertook to draw together a small group of academics with experience in fundraising – this group will look at possible sources of funding and the specific projects which could be funded. They will work with the PRC to research suitable projects that can be created and funded. The PRC was encouraged by the general air of the cooperation and enthusiasm shown at the symposium. There does seem to be real support for taking forward this idea of more coherent support for research in Glastonbury. There is much to be done but we feel that the first steps have been taken.